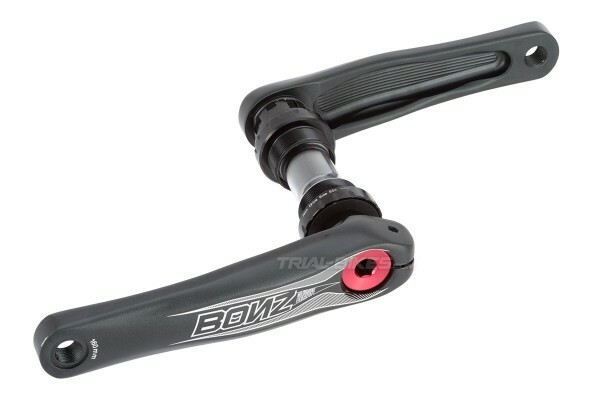 - New Bonz Pro Light crankset, as a novelty for the 2016 Bonz parts range. - Uses the Shimano BSC24 system, which is compatible with all frames that have a 68mm threaded bottom bracket tube. 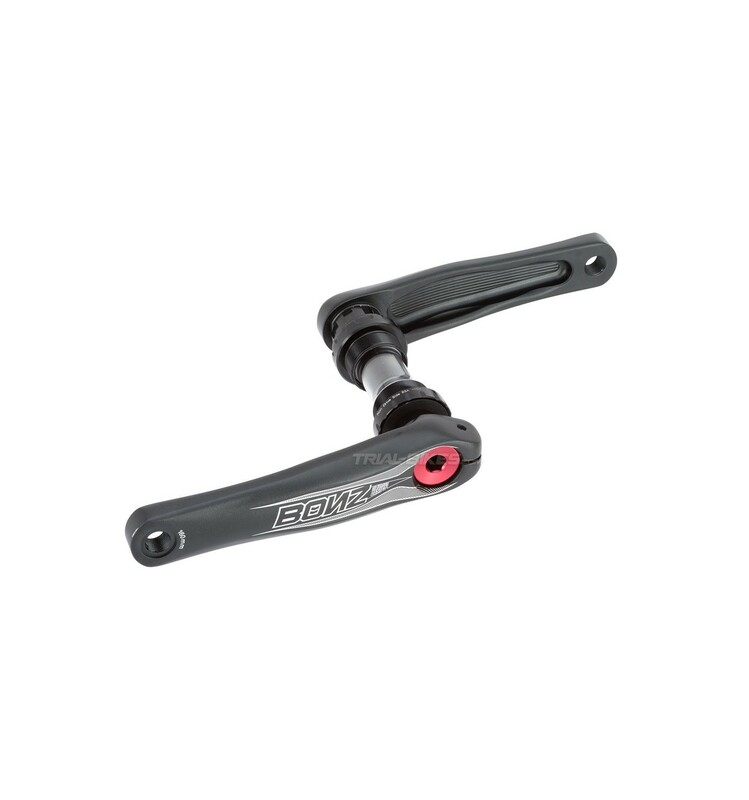 - Each crank has been forged from high quality 7075-T6 aluminium alloy, and features a huge pocket at the back of the arm to remove unnecessary material. 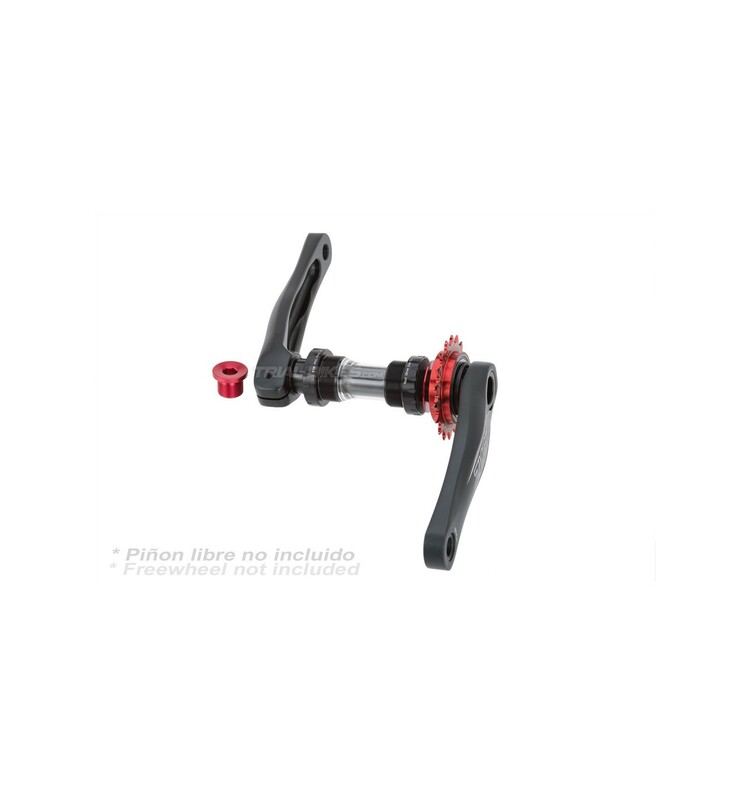 - The bottom bracket is made of high strength steel, it’s pressed into the right arm (cant’ be disassembled), and it has a 24mm diameter, with Shimano-48 type splines for the left crank. - Features standard external bearings for the 24mm axle, Shimano BB24 type. - The right crank has Shimano standard splines, without threads, which allows you to install and remove the freewheel much more easily than traditional threaded freewheels. -This system allows for increased stiffness and durability of the crankset, while also managing to save some weight. - The right crank is assembled with the 24mm axle and it can’t be disassembled, whereas the left crank is pressed into the axle and kept in place with an M6 Allen bolt. - Note: the pre-load bolt of the left crank mustn’t be overtightened, only just to keep the crank in place carefully. The M6 Allen bolt is the one that should be tightened, always applying less than 10Nm. - Available in 160mm, 165mm, 170mm and 175mm versions. - Does not include a freewheel or bashring. - Matt black axle, anodized matt black cups and cranks, with white laser etched Bonz graphics. - Note: it’s important to insert the red washer that sits next to the freewheel correctly. The flat side must be facing towards the freewheel, whereas the chamfered side must be facing towards the cup to eliminate backlash. 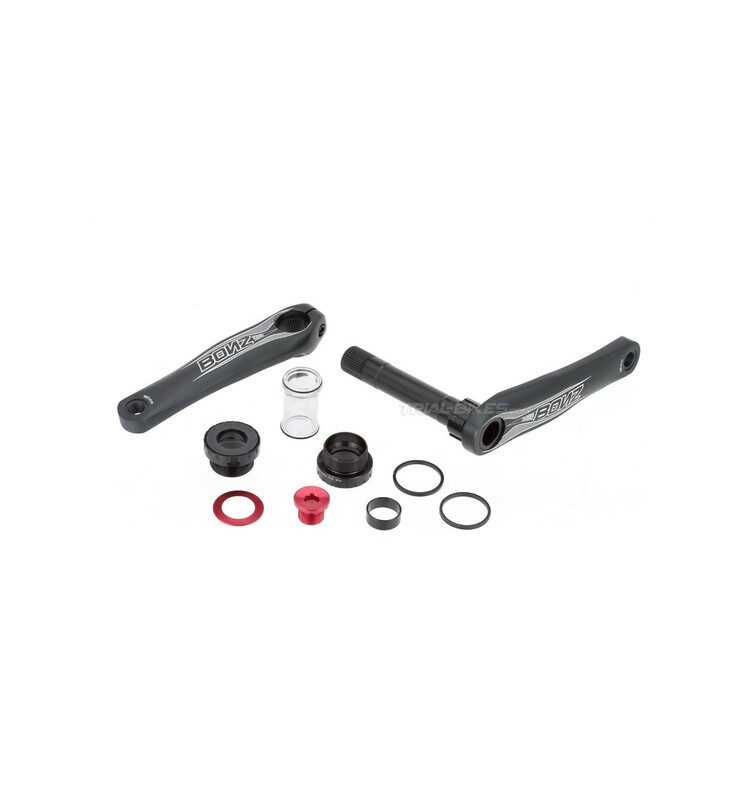 - This kit is compatible with all frames that have a 68mm threaded bottom bracket tube. - Not compatible with thread-less bottom bracket tubes. - Compatible with cassette-type freewheels, such as Bonz Pro Light, Clean, Crewkerz, etc. - A bashring up to 3,5mm wide can be installed. In case you don’t run a bashring, a 3-3.5mm spacer (supplied with the kit) must be inserted between the crank and freewheel to eliminate backlash. 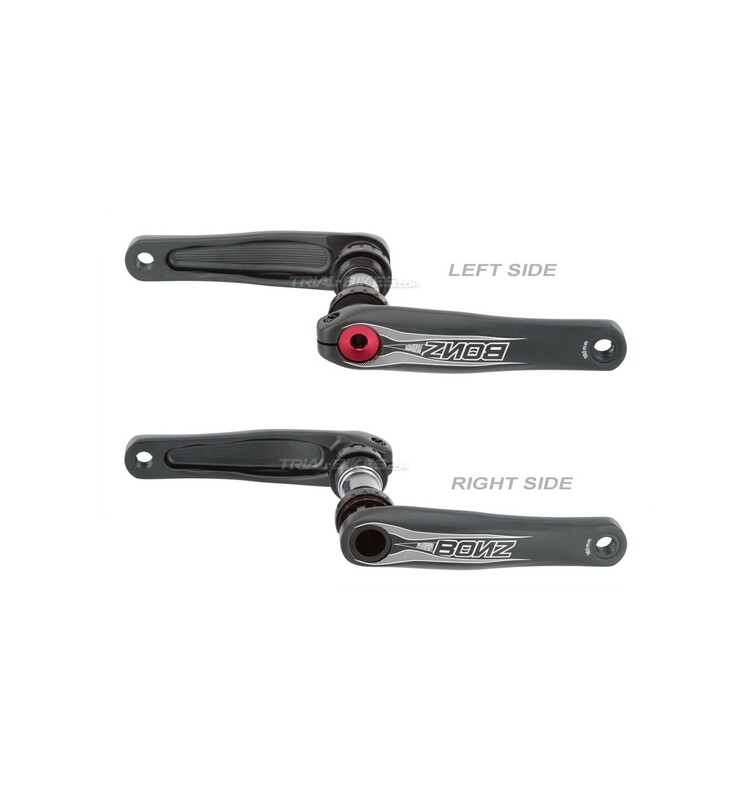 - The left crank is inserted onto the bottom bracket with Shimano-48 splines, therefore it’s not compatible with JIS, ISIS or any other types of cranks. - The cups have a 1,37x24tpi threads, for 68mm bottom brackets. - 10mm Allen pre-load bolt. - M6x20mm left crank bolt, for a 6mm Allen key. - 700.88g (160mm), 705.58g (165mm), 718.58g (170mm), 724.72 (175mm). Please note: when fitting or removing these cups, you must use an open BB30 key, and not the usual bottom bracket key. Please, check all the pictures to see how to install all the components in this kit.